ST. JOHN’S, Antigua, Jul 28 2014 (IPS) - Caught between its quest to grow the economy, create jobs and cut electricity costs, and the negative impacts associated with building an oil refinery, the Antigua and Barbuda government is looking to a mix of clean energy and fossil fuels to address its energy needs. Venezuela’s ambassador to Antigua, Carlos Perez, announced last week that Caracas was at an advanced stage of negotiations with the government in St. John’s to build an oil refinery on the tiny 108-square-mile island. 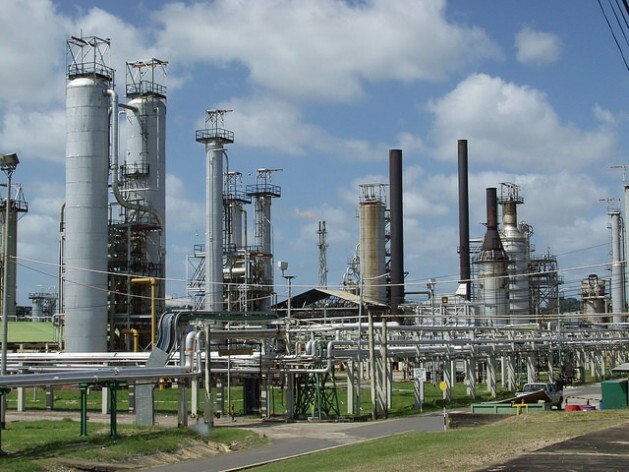 “The pending negotiations for the oil refinery I believe are well advanced and we’re hoping with this new administration of Prime Minister [Gaston] Browne we will advance to conclude that project that will be beneficial for Antigua and for Venezuela too,” Perez said. Browne’s Antigua and Barbuda Labour Party won General Elections on Jun. 12 after 10 years in opposition. Environmentalists, including Dominican Arthurton Martin, oppose the move and say it’s the worst possible time to make an announcement like this. “The United Nations Inter-Governmental Panel on Climate Change (IPCC) just released its 2014 report presenting evidence that not only can we expect a two degree centigrade rise in global temperatures but [possibly] a four degree centigrade rise, which will result in significant increases in coastal damage from sea level rise for countries like Antigua that are relatively flat,” Martin told IPS. “This will in fact result in significant extension of periods of drought as a result of fluctuations in temperature. This is also happening at a time when there are so many options that could deal with part of the energy challenge,” he added. Martin said the refinery was a bad choice not only because of the global movement to avert catastrophic climate change, but because cleaner alternatives are readily available. He suggested instead that government look into sources like biofuel, solar and wind energy to reduce reliance on crude oil. These sources of energy have already been developed and financing exists to explore these options. “These technologies are off the shelf. You can purchase them right now. You don’t even have to do R&D to develop them,” he said. Environmentalists stress that oil refineries are a major source of greenhouse gas emissions and other pollutants. Oil refineries also emit methane and nitrous oxide, which are more potent greenhouse gases than carbon dioxide, as well as several other air contaminants that pose risks to human health and the environment such as hydrogen sulfide, sulfur dioxide, nitrogen oxides, particulate matter, and volatile organic compounds. Chante Codrington, director of Wadadli Industrial Renewable Energy Ltd, who is in negotiations with the government of Antigua and Barbuda to build a wind farm here, is of the view that wind energy is the most efficient and affordable energy source for the island. “No good can come from the oil refinery. The environmental concerns associated with the burning of fossil fuel in a country whose main industry is tourism are many,” he told IPS. Clean energy advocate John Burke agrees with Codrington, telling IPS it would benefit the island’s poor more if the country goes green. According to a report by the Economic Commission for Latin America and the Caribbean (ECLAC), energy demand in the region is expected to double in the next 20 years, at a 3.7 per cent average annual rate of increase. Currently, most Caribbean countries are heavily reliant on imported fossil fuels, their energy consumption being based almost solely on oil products, which account for more than 97 per cent of the energy mix. Trinidad and Tobago, Cuba, the Dominican Republic and Barbados cover part of their fuel requirements from their own reserves of oil and natural gas. Nevertheless, only Trinidad and Tobago has significant, proven fossil fuel reserves. Several Caribbean countries spend 15 to 30 percent of their export earnings, inclusive of revenues from tourism, on oil products. This results in electricity prices of between 20 and 35 cents per kWh, much higher than in the United States or Europe. Peter Lewis, managing director of the Bermuda-based Carib Energy Solutions, said the government should consider the environmental factors associated with an oil refinery. “If the global trend of a mixed-bag approach is the best option for the pursuit of an energy agenda…you would be able to attract more entrepreneurs to the business sector and get the economy going,” he told IPS. Martin also agrees with the mixed-bag approach. “No single source of power should be allowed to deal with your entire energy bill. That is a bad thing to do,” he said. “We had our banana experience in Dominica when we placed all our bets on one crop. My advice is no country should place all its bets on any one source of power. Even Venezuela is understanding that right now. “So if solar can contribute three per cent, if wind can give you 15 per cent, if biomass conversion can give you 20 per cent, what you are doing is effectively reducing your dependence on the dirtiest form of energy which is fossil fuel driven energy,” Martin added. In early 2007, the government of Dominica announced plans for Venezuela to construct an oil refinery on the island but after a barrage of objections was raised by environmentalists, plans for the plant were placed on hold in 2008.